Our favorite punks from The Netherlands, Rats On Rafts, have combined with fellow Dutch punk rockers De Kift on the intriguing "Sleep Little Links 2 3 4". The combination is mind-blowing rock magic, and will prompt any fan to ask "can't they play together more often?". Actually, there is an answer to that question. They are playing together quite a bit in the next few months. See below for a list of their joint dates, as well as additional performances by Rats On Rafts. But wait, there is even better news (because many of our readers don't live in Europe) -- the bands are releasing a collaborative album via Fire Records on October 14. Jon Rooney is a superb, Seattle-based singer songwriter whose current project is named Virgin Of The Birds. Their album Winter Seeds was one of our top thirty albums of 2014. Secret Kids, the second VotB album, will be released in October via Abandoned Love Records in North America and Edinburgh's Song By Toad Records in the UK/Europe. The first single from Secret Kids is "Spooky, Stony, Barely Over Thirty". Jon and his co-conspirators are in fine form on this autobiographical ramble, and if this song is representative, this album is going to be one of my favorites. Sometimes I research the hell out of a new discovery, and sometimes I go with my instincts. When I watch the video for "Talk Like That" by Australia's Jack River, my first impression is that Holly Rankin is a strong and talented woman, and I feel quite comfortable with that assessment. My second impression is that we would like to hear more from her, and I understand that she will deliver an EP later this year, so we are having a good night. "Talk Like That" is available now via your preferred digital platform. New York's KNGDAVD is back again with a tune they contributed to this week's soundtrack for Guilt. We really need more music from this project. I hereby request that they suspend normal life and get busy. I loved Popular People Do Popular People, the debut album from Dunedin's The Prophet Hens, so much that I expect I would be extolling the virtues of their follow-up even if it duplicated its predecessor. 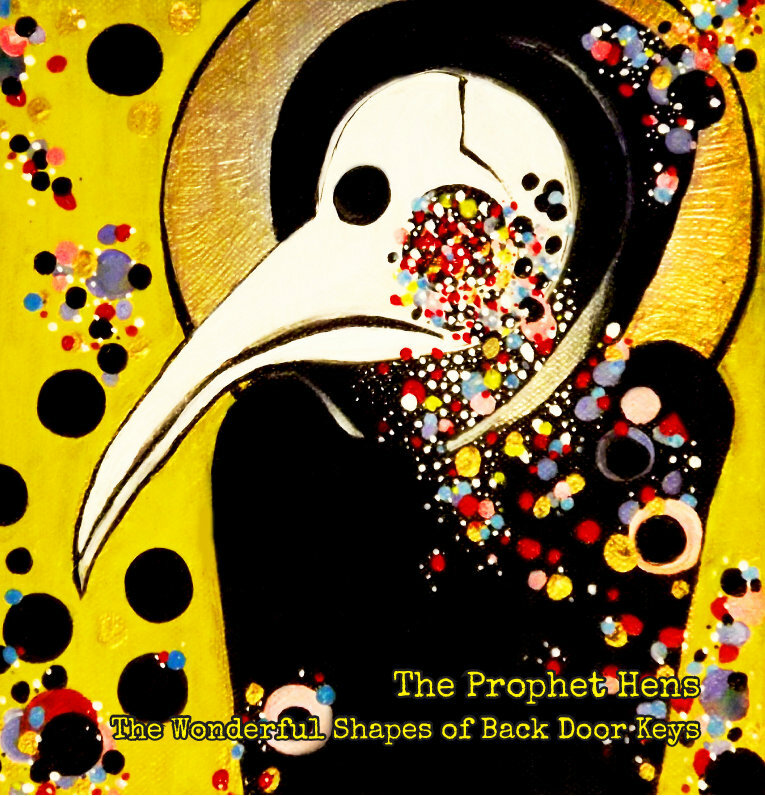 Happily, however, the band's talent and ambition spare me that embarrassment, as The Wonderful Shapes of Back Door Keys takes all that was good before and builds on it like a visual artist taking his line drawings and turning them into a full oil painting. The hooks and jangle over a insistent and sturdy rhythm section remain. But the vocals from Bray and Esplin are more confident and expressive, and their interplay is among the highlights of an album of highlights. Esplin's Casio keys are more prominent, alternating between melancholy shading and a circus-like adrenaline jolt. Thematically, the scope is broader, with bassist Cederman adding his songwriting contributions to Bray's. Stylistically, the kinship to other Dunedin bands is evident to listeners aware of the band's hometown. But listeners unaware of such details could be forgiven suggesting hometowns such as London or Glasgow, with a nod to The Feelies on the side. After multiple listens, I cannot identify a song that stands out from the others, but that is true only because the songs all have such adeptly layered emotions and elements, such perfectly blended melancholy and hope, that each listen reveals new joy. At various points my favorite song has been "Drunk In A Park", "Basically", "Only One", "Songman", and "Popular People". I'll listen again tonight and may well find a new candidate ("I Might Not Be Right" is trending heavily). The overall feel of the album is uplifting, to no small degree owing to pace of the tracks and the rich detail in the arrangements. We don't want to put scandalous notions in the heads of indie guitar pop fans, but you could even dance to this album. The Wonderful Shapes of Back Door Keys is released by Dunedin's Fishrider Records, but for fans in the UK/Europe it is jointly distributed by Occultation Recordings. North American fans can buy physical copies from Jigsaw Records and Midheaven soon, and if you can't wait, order from Fishrider and have it shipped. You can stream the entire album at the Bandcamp link at the bottom of this post. The Prophet Hens are Karl Bray (guitar/vocals), Penelope Esplin (keys/vocals), Robin Cederman (bass), and Ben Morton (drums).